UPDATE: We would like to thank everyone for attending the GRC Open House Fundraiser. Over 100 children and their families attended, which brought in over $600! 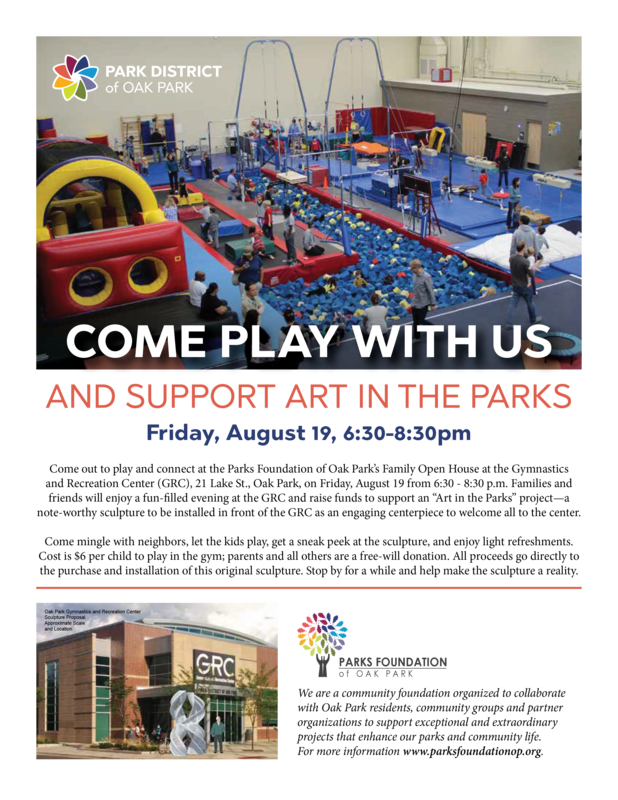 Come out to play and connect at the Parks Foundation of Oak Park’s Family Open House at the Gymnastics and Recreation Center (GRC), 21 Lake St., Oak Park, on Friday, August 19 from 6:30 – 8:30 p.m. Families and friends will enjoy a fun- lled evening at the GRC and raise funds to support an “Art in the Parks” project—a note-worthy sculpture to be installed in front of the GRC as an engaging centerpiece to welcome all to the center. Come mingle with neighbors, let the kids play, get a sneak peek at the sculpture, and enjoy light refreshments. Cost is $6 per child to play in the gym; parents and all others are a free-will donation. All proceeds go directly to the purchase and installation of this original sculpture. Stop by for a while and help make the sculpture a reality.